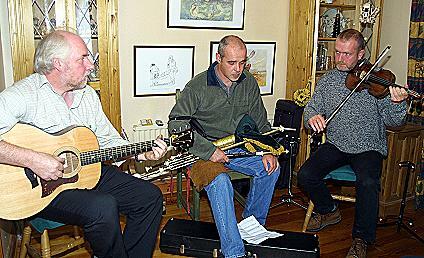 A range of traditional and original music and songs drawing on the Celtic / Irish tradition. Cara's varied performances include virtuoso guitar and fiddle playing by John Rawlings and Davy Oakley respectively, uilleann pipe and fiddle unison playing, mandolin dueting and lovely songs. Mainly Irish traditional music and songs combined with original material written by Davy Oakley and Mike Ryan. CD Albums recorded at Lake Recording Studios, Boyle, Co Roscommon. Cara appear regularly at Market Rasen Folk Club, have a long-standing association with a weekly session at Goxhill, North Lincolnshire and have recently played at Cottingham Folk Club, Grimsby Folk Club, Brigg Fiddle Festival, Beverley Fringe Festival, and Saddleworth Folk Festival.